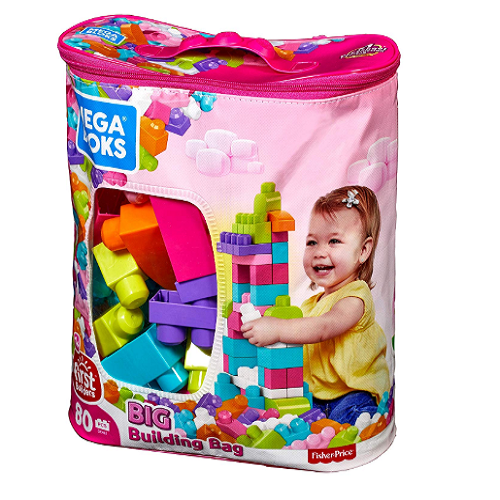 Mega Bloks 80 Piece Pink Big Building Bag Only $14.24! Mega Bloks are always a hit with the kids! Grab this 80 Piece Mega Bloks Big Building Bag in Pink for Only $14.24! Designed specially for toddlers, First Builders blocks are easy to hold, stack and take apart. The oversized prongs that hold the blocks together are integrated into the toys – even the lids of storage tubs – ensuring full compatibility across the Mega Bloks First Builders world. It all starts with the Big Building Bag! The bag is the perfect starter collection for your little ones to build and rebuild anything they dream up and engage in hours of open-ended creative play. Available in a variety of color schemes, including classic colors, lighter pastels, and trendy bright colors, this original favorite appeals to both boys and girls.